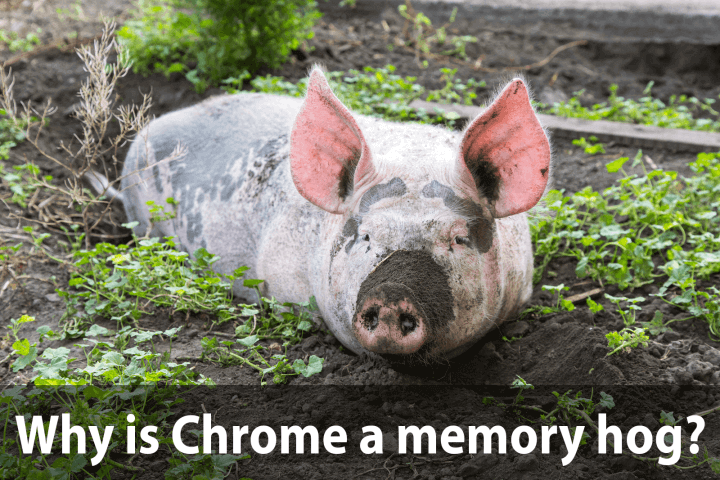 Surfnetkids » Tech Tips » Browsers » Why Chrome is a Memory Hog? The Chrome browser from Google is fast and I love it. But it’s a memory hog, and if you have too many tabs and too many addons, your computer can slow to a crawl, or even crash. To see how much memory Chrome is using, use your Windows Task Manager or Mac Activity Monitor. Here’s how. Windows: Press Control + Alt + Delete at the same time. Click Task Manager, adn then Click the Processes tab. Mac: Open the folders Applications / Utilities. Open Activity Monitor. Click the CPU and Memory tabs. Now here’s what you can do to improve Chrome performance. 1) Reduce the number of Chrome tabs and windows you have open. 2) Reduce the number of Chrome extensions you have enabled. 3) And last but not least, you can usually add more memory to your computer. I did that recently, and along with disabling a lot of Chrome extensions, that did the trick for me. Feldman, Barbara. "Why Chrome is a Memory Hog?." Surfnetkids. Feldman Publishing. 9 Jun. 2015. Web. 23 Apr. 2019. <https://www.surfnetkids.com/tech/3793/why-chrome-is-a-memory-hog/ >. By Barbara J. Feldman. Originally published June 9, 2015. Last modified June 8, 2015.